Past students from across six decades returned to Sydenham High School for a reunion lunch on Saturday 25th February to mark the occasion of the school’s 125th anniversary. Some were students who had left in the fifties and others as recently as the noughties. 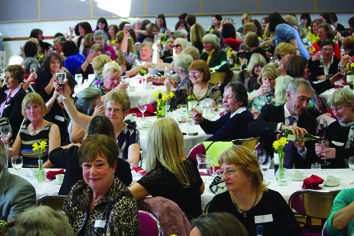 170 alumnae together with governors and teachers past and present enjoyed a reception and lunch organised by the Old Girls’ Association in the school’s Longton Hall. Mrs Pullen, Headteacher welcomed the guests including her predecessor Dr Lodge (1999-2002) who is now Headteacher at Putney High School. Mrs Baker (1988-1999) was unable to attend. Mrs Pullen remembered previous Headmistresses known to the guests, Miss Yardley (1942-1966)and Miss Hamilton (1966-1987, who died last year) and said she was fortunate to have known four of the school’s previous eight heads and the great sense of continuity that gave to the school. Students were able to swap fond (and not so fond memories), tour the school to see how it had changed and see a presentation of the school’s archive for which funds are being raised to make it available online after it was damaged in a fire in 1997. Amongst the guests there were three generations of the King family who had all attended the school as well as families where four siblings had been to the school. Two celebration cakes showed the school’s original chrysanthemum logo and the logo as it is today. The cakes were cut by Mrs Pullen and former head of the Junior School, Barbara Risk, who retired last year after 17 years of service.